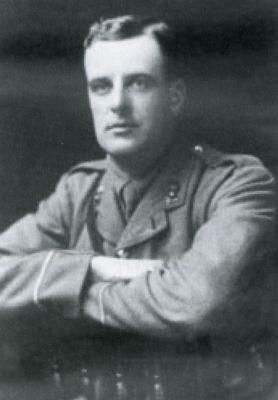 Lieutenant Charles Lewthwaite was the second of the “Old Leek Battery” officers to die in France. The Battery had lost Lt Basil Nicholson earlier in the war in 1915. He had previously been awarded the Military Cross for bravery, his citation reads “he showed great courage and promptness in putting out a fire which had broken out in his gun position caused by heavy hostile shell fire. He also went out into the open under heavy fire and rescued a wounded infantryman. His work at all times has been remarkably good”. Charles had been with the Battery since the start of the war, mustering with the unit on the 14th August 1914 at Leek in his civilian clothes as his new uniform had not yet arrived. In February 1916 the Battery were stationed in a Chateau near Long and whilst there many of the men and Batmen helped themselves to the silverware and some was put in the Officers Mess Skip. When the Battery moved on near Wailly the Officers were at Dinner, when Major Challinor received a bill for £150 for the missing silver from the caretaker at Long. Major Challinor was all for punishing those who had taken it. The men of the Battery that night were quickly buring the loot. Lieutenant Lewthwaite told the Major he would deal with it. Charles paid the bill out of his own pocket and nothing more was said. Charles was interred along with some other members of the Battery at Fosse Number 10 Cemetery. “Tiffy” Biddulph made a brass plaque from a shell casing for his makeshift coffin. It was not uncommon for officers to request their horses be put down should the officer lose their lives. Charles’ horse was called “Sammy” and it fell to Sgt Farrier Taylor of the Battery to carry out Charles’ wish.